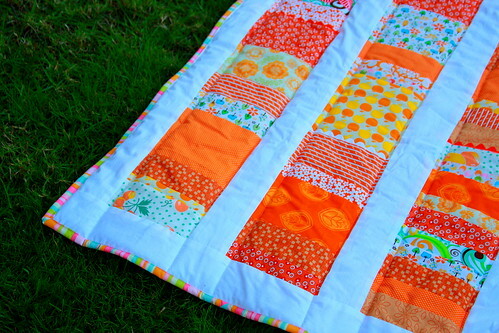 Stitches and Scissors: Just a Peek Quilt. I finished my first stacked coins quit today and I could not be happier with it! My mom helped me figure out a pattern, mainly how wide I should make the orange strips and the white sashing, I think it turned out great. I did not have enough of the "Tossed Trees" fabric that I bought at JoAnn's for the back of the quilt, so I improvised and added some white and I love it. I found this great stripe material for the binding from Sandi Henderson Farmer's Market line, which I LOVE. It was the first time I did this kind of binding, I always do continuous bias binding, but that wouldn't work with a stripe. Here is the ric rack sewed on a strip before I made the top of the quilt. 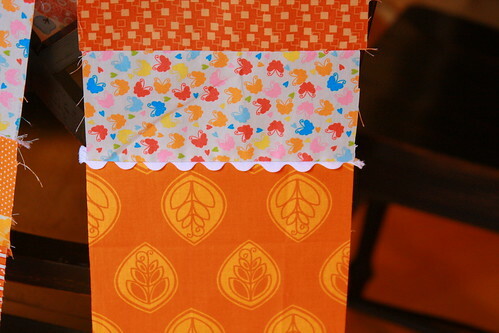 I love the little bits of ric rack, I am totally going to use it again in a quilt. 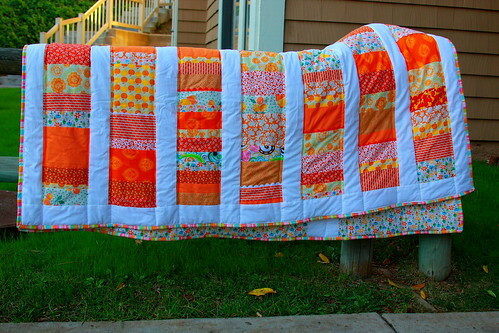 When I am done with a quilt, I fold it up and just look at it. I know it is weird, but that is what I do. It measures 65x85. Long enough for my husband, who is 6'4", to lay under. It looks really good, I love the back! I love the backing fabric. I need to check out my local Joanns. I like the white on the back, it looks a little like a tree with a branch out to the side. It looks great. A good choice of colours. Beautiful! I love the back as well. Great job. 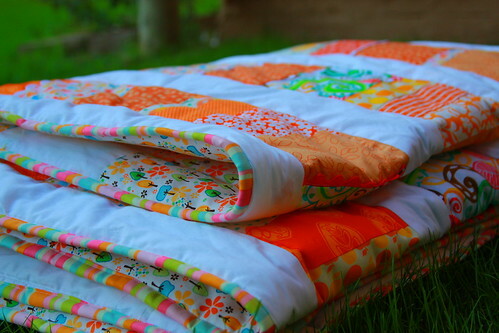 I've already told you how much I love this quilt. Infact, it's the inspiration for one of my "projects". I'll let you know when it's done. Wow, it is fantastic! I love the colors and the bits of ric rack. Super cute. That looks so gorgeous, great job! I can't wait to give it a try the next time I'm over there! wow, that is so pretty! I love how you did the back, and I love the little bits of ric rak sewn into the seams! 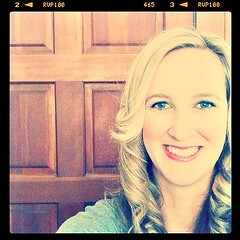 Hi Darci ~ Today I took the time to go through your blog. 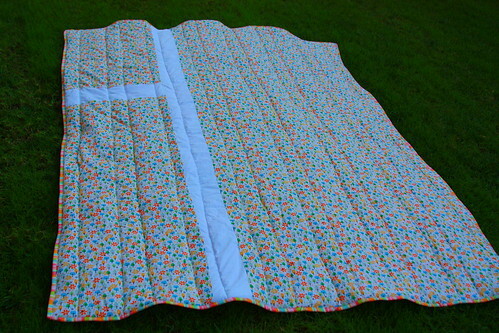 Wow, you make wonderful quilts. I really really love the colors you use. They are so bright and happy. Having these around you, you can never be in a gloomy mood, I think. Love this! The colors are so happy and summer! 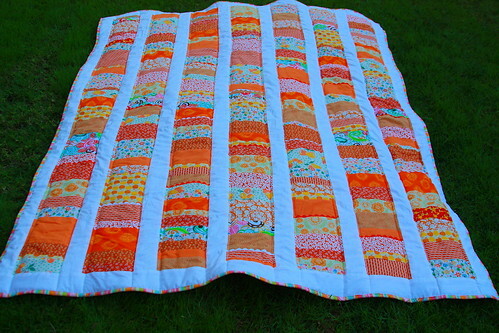 Hi, I love this quilt. It's so bright and cheerful. I think I'll have to have a go at the stacked coins pattern sometime.